NEW YORK – She always knew it was a strong possibility. Just about every media outlet had Jordin Canada going to the Seattle Storm in Thursday’s WNBA Draft, and it made too much sense considering their familiarity with the Pac-12 product. 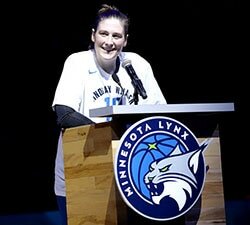 Thus, it came as no surprise when WNBA President Lisa Borders announced her name for the No. 5 overall pick. Still, she couldn’t help but smile while holding up the Seattle jersey for the first time. The Los Angeles native will be fortunate to stay on the West Coast, team up with fellow L.A. native and UCLA product Noelle Quinn, and play alongside some of the best young talent in the league. 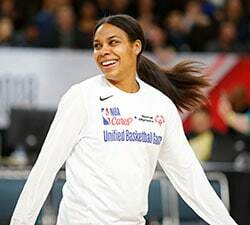 Perhaps most exciting of all, she will learn from the best point guard in WNBA history. “Sue Bird is very influential to me,” Canada said. “I just watch how she leads her team, the way she sets up her teammates, creates for others and takes over when need be. Indeed, Canada has reached out to Bird in the past to pick her brain. The 5-foot-6 point guard spent plenty of time in Seattle during college, playing in Pac-12 Tournaments at the Storm’s KeyArena and facing the Washington Huskies on a regular basis. Now, Seattle fans will hope to see her put on a show with Breanna Stewart and Jewell Loyd for many years to come. It’s easy to see why the Storm targeted her early in the first round. Canada finished her career as one of the Pac-12’s most dominant players on both sides of the floor, ranking first in all-time assists (831) and third in steals (347). She averaged 17.0 points, 7.1 assists, and 3.3 steals this past season while guiding UCLA to its first Elite Eight appearance in almost 20 years. A two-time Pac-12 Defensive Player of the Year, Canada led the conference in steals for two-straight seasons. On the offensive end, she shot 13 percent from three-point range as a freshman and improved to 39 percent as a senior. 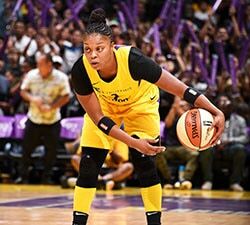 “Is there a player that’s more fun to watch than her?” ESPN’s LaChina Robinson said on a conference call with media before the draft. “She can lose a defender off the bounce, no problem. Very classy. She can penetrate the defense, find the seams. She’s got the next-level quickness. Not a pure shooter, meaning I don’t think she’s thinking about shooting the three every time she touches it. Canada reiterated that getting stronger is the main focus heading into her rookie season. She figures to come off the bench right away, which will aid a Storm unit that has ranked last in bench points for two straight years. Bird, now 37, arrived in Seattle 16 years ago and has captivated Storm fans ever since. Canada is hoping to replicate the success of a legendary floor general.